I have a great passion for food science research and plan to find a job in a research institute or university. There were three major factors I considered when choosing UBC's graduate program: high education reputation, supportive and productive supervisor, and match of research interests. UBC and my supervisor meet all my expectations, and even more. Plus, the weather and the pace in Vancouver is just like my hometown Chengdu. Vancouver provides us with a great balance between city life and exposure to nature. There are tons of tasty restaurants from different countries as well as diverse art galleries. On the other hand, nature is accessible within one-hour driving, in places like Stanley Park, Capilano Suspension Bridge and Grouse Mountain. The most attractive thing in our program is the collaborations between different laboratories and institutes. Take our Food Safety Engineering Lab for example. We not only work in our own laboratory to study the survival of foodborne pathogens, but also have access to analytical instruments in other departments, conduct field studies with Agriculture & Agri-food Canada in Summerland, get support on animal studies from BC Children Hospitals, etc. Lack of practical experience in food industries might be a big challenge for me. Food science is an applied science, so it is necessary to make sure our research studies meet public demands and solve realistic problems. Otherwise, there might be a big issue with the application of research funding from food industries. Our program offers various courses that cover both basic principles and practical cases in food industries. Besides, industry-based internships/projects are available by Food Safety Engineering Lab and Mitacs. My undergraduate university (Zhejiang University) provided me with various opportunities in national and international research internships. By conducting these research projects, I enriched my resume, learned basic experimental design, gained leadership and communication skills, and developed a clear goal for graduate school. Dog walking! 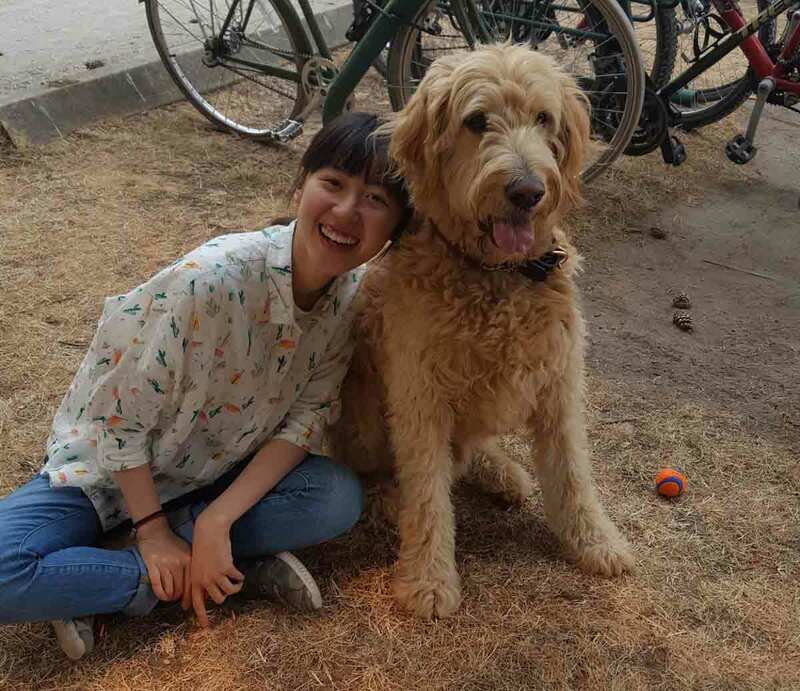 It is refreshing and joyful to walk our lab mascot TUTU on campus, particularly when I am loaded with lots of lab work and can hardly find time to hang out. I also love hiking, doing yoga, exploring multicultural food with friends, and visiting museums during my spare time. Believe in yourself AND don’t be shy to ask for helps when you are stuck. Graduate school can be very stressful especially when research progress is not satisfactory. But trust me, there is always a solution after talking to supervisors and committee members, brainstorming with peers, and seeking help from library workshops. Additionally, actively building social network will benefit you in a long run, such as gaining life-long friendship, finding a job, and creating research collaborations. Foodborne pathogens and rapid emerging antimicrobial resistance put big burdens in public health and economic growth. Antimicrobial-resistant infections are estimated to cause 10 million deaths annually and a 3.5% of reduction in gross domestic product by 2050. To tackle this problem, it is critical to understand the relevant mechanisms and develop efficient detection approaches. However, conventional methods are either time-consuming or require expensive and sophisticated equipment. Therefore, my current research interests focus on: a) understanding the molecular basis of resistance using vibrational spectroscopies; and b) develop accurate, rapid and cost-effective detection sensors.